Microsoft announced today that Forza Horizon 3 has officially gone gold, meaning the game is ready for physical copies to be manufactured and the digital release to be set up. This announcement comes with a few updates, including Windows 10 PC specs, the full list of Xbox Live achievements, language localization, and a new vehicle. 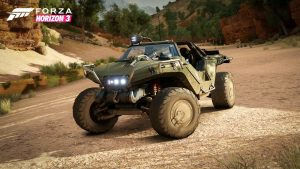 The Warthog from the Halo universe will be available in Forza Horizon 3. The military transport is officially called the 2553 AMG Transport Dynamics M12S Warthog CTS. Unlike the military vehicle from Halo, this Warthog doesn’t have a turret. However, it does have a 720 bhp turbo V8 engine, making it much faster than its military counterpart. The Warthog also has the best suspension of any car in Forza Horizon 3. The Warthog will be available at launch and will be sent as a free download to anyone who has played either Halo 5: Guardian or Halo: The Master Chief Collection on Xbox One. Players who are eligible will receive download codes via an Xbox Live message, and codes will be sent out during the week of September 5. Those who haven’t played an Xbox One Halo game can earn the Warthog through a special #Forzathon event coming in October. Get a 3 Stars on a Danger Sign, Drift Zone, Speed Trap and Speed Zone in the 2017 Ford Raptor. For those wondering about using wheels in Forza Horizon 3, an announcement is coming regarding wheel support for Windows 10. Forza Horizon 3 is coming September 27 for Xbox One and Windows as an Xbox Play Anywhere title. This means that buying the game digitally on one platform allows you to play it free on the other. Anyone who purchases the $100 Ultimate Edition can get a head start on the action and start playing on September 23. The post Forza Horizon 3: Gold Announcement Update appeared first on Sports Gamers Online.